Libertarian Today: George W. Bush declares patriotic, anti-war, America-firsters opposed to open borders, globalism and Big Government swindle to be "evil"
George W. Bush declares patriotic, anti-war, America-firsters opposed to open borders, globalism and Big Government swindle to be "evil"
Consider his latest excursion into the history of the republic, at Southern Methodist, where the Great Man’s papers are to be housed. As for “protectionism,” Harding did approve the Fordney-McCumber Tariff Act of 1922, doubling rates to 38 percent. But he also slashed Woodrow Wilson’s income tax rates by two-thirds, back to 25 percent. Result: Unemployment, 12 percent when Harding took office, was 3 percent when Calvin Coolidge left. Manufacturing output rose 64 percent in the Roaring Twenties. Between 1923 and 1927, U.S. growth was 7 percent a year. At decade’s end, America produced 42 percent of the world’s goods. Compare this economic triumph with the fruits of W’s free-trade policy that wiped out 6 million U.S. manufacturing jobs, one of every three we had, and put America in hock to China. The protectionism Bush calls “evil” was the policy of 12 Republican presidents from Abraham Lincoln to Coolidge, who made the GOP America’s Party and converted this country into the industrial marvel of mankind. As for “nativism,” the term dates to the mid-19th century and had to do with hostility to Catholics and Irish, not Italians and Jews. Is every immigration restriction law “evil,” Mr. Bush? Are Japan and South Korea evil because they have never accepted immigration? Has mass immigration benefited Europe, where David Cameron and Angela Merkel are bewailing the disaster of “multiculturalism”? Is your successor, Gov. Rick Perry, evil for calling for troops on the border to stop the invasion you failed to halt? 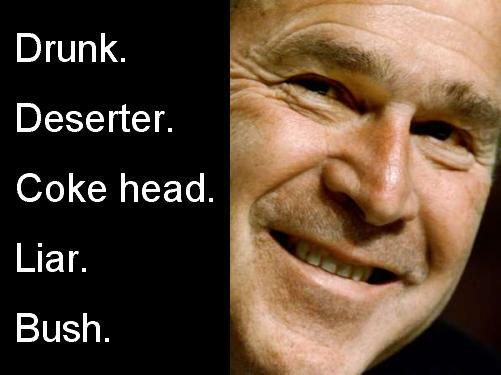 For eight years, Bush pursued interventionism, free trade and open borders. Result: two wars that have bled his country and reaped a harvest of hate, the deindustrialization of America and a republic on its way to becoming the new world order’s Tower of Babel. Bush and his neocon ilk are just the Right side of the pubic-private Swindler Class, with Clinton and his neoliberal ilk epitomizing the Left side. These people are professional grifters who dash in and out of government “service,” manufacture crises, and then get rich by selling out the country and by pumping up Big Government and statist-corporatist “solutions,” of which they always manage to take a big cut. Speaking of evil, who was it that lied America into the Iraq war? These people are moral rot of the lowest order. That Bush can even show his face in public without being plastered with rotten eggs is a moral travesty.